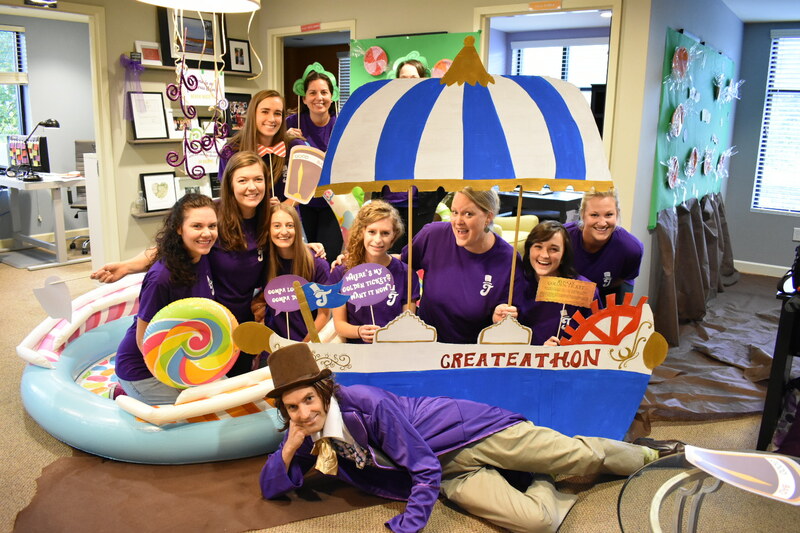 Our inspiration for our 12th annual CreateAthon theme was “Willy Wonka’s Chocolate Factory – A World of Pure Imagination.” And boy, did our party planning committee deliver! There was a chocolate river with a TRIO boat, a glass elevator, a fizzy lifting station and all the candy you could ever want. We started to keep a tally of all the candy we consumed…but lost count around number 50 (which we hit about 20 minutes in). Fueled by pounds of candy and gallons of caffeine, we spent 24 hours working on projects for some pretty incredible organizations around the Lowcountry. After taking the time to recoup and re-energize over the weekend, we thought we’d share some of the CreateAthon magic we worked on over our 24-hour marathon (in no particular order). This sexual assault advocacy program was looking to change up its branding in order to better share its story and the services its team provides throughout Charleston, Dorchester and Berkeley counties. To help, our team dove into a comprehensive rebranding marketing plan, which outlined steps for launching the new brand and re-introducing it into the community. We even came up with a few new name options — stay tuned on their social media to see how this organization will evolve in the future! Camp Rise Above provides life-changing camp experience to children with serious illnesses, disabilities and challenges. In order to show them some love, our wonderfully imaginative designer Laurel created some beautiful new logo options that will hopefully help this organization “rise above” the noise and reach children and families who could benefit from the programs they provide. We can’t wait to see this new logo out in the community and on their Facebook very soon. This nonprofit, grassroots organization is dedicated to helping the incarcerated or recently released break the cycle of destruction and lead a healthier, more productive lifestyle after release. To help them better communicate their mission and connect with those who could benefit from their services, our team put together two brand new outreach flyers that they could hand out, as well as a database of government officials and organizations that could reach the recently released. We are confident that this organization is going to continue to grow throughout the Lowcountry. Follow along on Facebook! Finally, we wrapped it all up by giving some love to the Charleston Council, Navy League of the U.S.
You don’t have to be in the Navy to be a part of this amazing organization, which is made up of around 130 members from the business, professional and retired communities and is tasked with carrying out the mission of the Navy League in the Lowcountry. Most recently, they were tasked with commissioning of the USS Charleston, an independence-class littoral combat ship (LCS-18) in March. To help them spread the word about this incredible honor, we set up social media channels for them, along with a full social media calendar and an e-newsletter template. We look forward to seeing the successful commissioning of the USS Charleston on social media very soon. And that’s not all. In addition to the projects listed above, we also worked on a 2018 CreateAthon To-Go kit, featuring tons of helpful marketing tips from our team and comprehensive social media and SEO assessments to help our CreateAthon recipients have the best online presence possible. And, of course, our sweet friends and family! 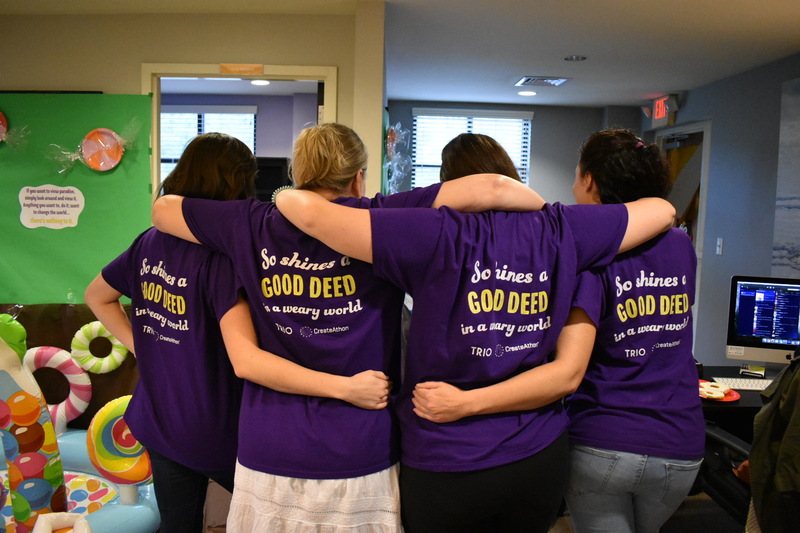 We’d like to give an extra special shout out to Julia Bailey, Jenny Dennis, Laurel Welch and Abbie Linnerud, who helped transform our office into a world full of pure imagination and kept us well-fed and entertained all day and all night long! Until next time, Lowcountry…remember to work hard, enjoy life and make a difference.